Annalisa in now an “official” Ancient Faith podcaster! Here she introduces her video podcast to her new audience. 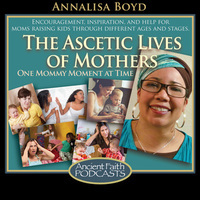 Bobby interviews Annalisa Boyd, the author of the new AFP book The Ascetic Lives of Mothers: A Prayer Book for Orthodox Moms. Who is the Theotokos, and why is she so important?